The adventures of Mad Jack. 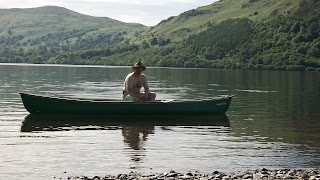 : Ullswater camp and canoe. The adventures of Mad Jack. The mission isnt over till your heart stops beating. I have finally allowed myself some leisure time. I have been chomping at the bit to get out an have fun since moving up here and on Sunday morning the time came. It was a bright and sunny 7.15am, and with no plans for the day Karen suggested we go canoeing. Music to my ears I thought to myself, so a plan was set in motion. 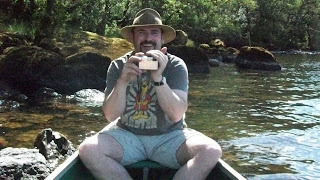 A coffee and a fag later saw me slinging stuff in the back of the motor and strapping the canoe to the roof (at a leisurely pace) while Karen made some sandwiches. By about mid day we were on our way and after taking the scenic route we arrived in Patterdale about 2pm. 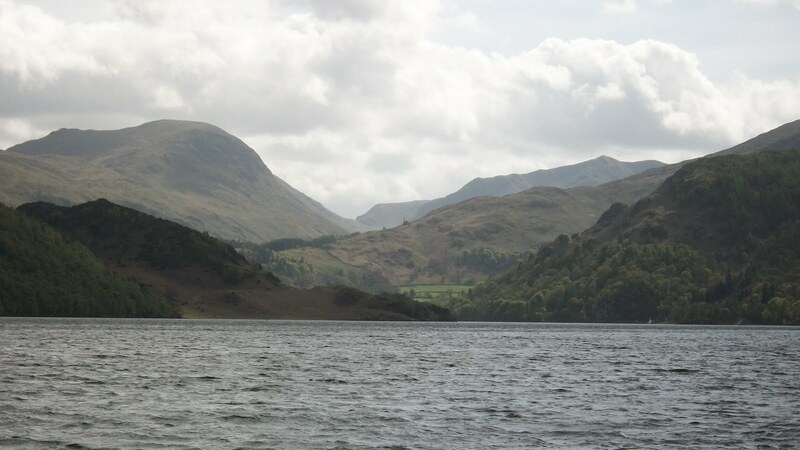 The campsite of choice was Side farm, its situated on the south east shore of Ullswater surrounded mountains and just north of Kirkstone pass. We pulled on and paid our £14.00 for the night, it sounds a bit expensive as campsites go but this is the summer season in the Lake district and the location just cant be beaten. There were quite a few tents on but spread about as the weekend campers were leaving and we decided to go for a paddle before putting the tent up. That would mean we would have more choice of pitch later and as it turned out it was a good decision as we got a prime spot when we did. 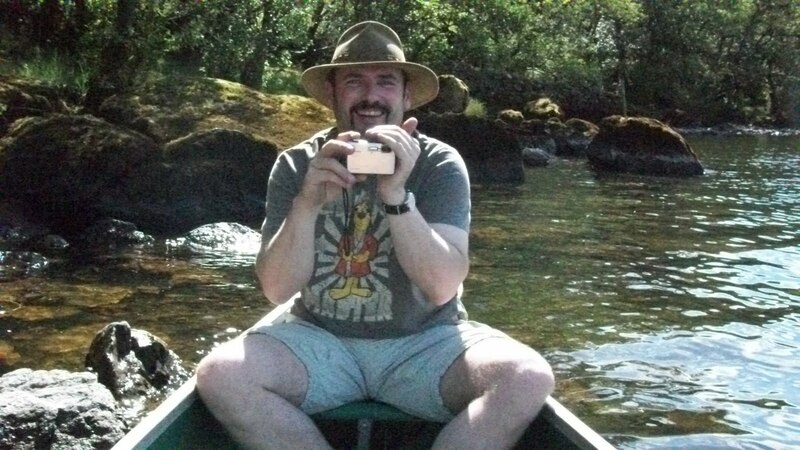 We had some sandwiches and then I took the canoe off the roof. Its a fifteen foot Canadian canoe made by Coleman. The model is quite an old one and is lacking the built in cup holders and cool box that seem to be the norm on the newer models, it has lots of scrapes and scratches to the hull, but it paddles well and I'm not really into all the mod cons and keeping up with the latest trends so its a good boat as far as I'm concerned. I ported it down to the waters edge through the trees which was about ten meters from where we had parked, Karen brought the paddles, float coats and the bag with our bits in it down behind me and we pushed off heading up the lake. It took a few minutes to get sorted and into a rhythm, and then it was just sunshine and silence as we slid through the water heading north contouring the eastern shore. 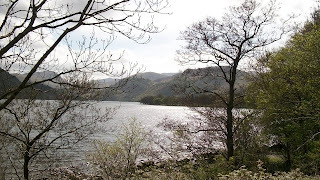 On the west side of Ullswater runs the A592 from Glenridding to Poolybridge and it sees a fair amount of traffic in the summer, it also has lots of layby's and the tourists tend to park up and sit on the lake shore. But that's on the west side and we were on the east side so the traffic and the tourists were just silent dots in the distance. We paddled on at a leisurely pace stopping now and again to look at things along the shoreline and just generally bugger about, Some of the shoreline is gravel beach but mostly its steep and rocky with dense foliage and in some parts its cliffs and there is lots of little coves to explore so the scenery is never boring on this side of the lake. We went up about 6K and stopped about parallel with the small village of Sandwick on the east shore. The spot we chose was very quiet and secluded, we opened a bottle of red wine and soaked up the sun in our little private cove, and the world was a good place to be. We set off back to the campsite after a while and the paddle back was just as good and the last few Ks Karen sat and chilled while I did the paddling on my own. 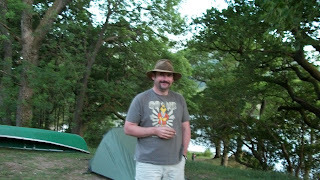 When we got back to the camp site it was evening but still daylight and I set about putting up the tent. The chosen spot was on the tree line and had a fine view overlooking the lake through the trees. Once the tent was up and our sleeping bags were laid out I made us a hot brew and then set about supper and made some thick soup using the Kelly kettle. The Kelly is a magic bit of kit and burns anything and everything, just about anything you can find lying about that's combustible will boil a litre of water in two minutes using its water jacket design, and when cooking you just lift the kettle off the base and put a mess tin on it. We crawled into the tent at about 11pm and after sitting watching the moons reflection on the water framed by the trees we went into a peaceful sleep. Until we were woken up by a badger two hours later! We got up late'ish Monday morning and had toasted crumpets with syrup and coffee, then after packing everything up, we drove the scenic route home. Perhaps not the adventure of a lifetime but not bad for an unplanned trip and it was fun. There will be lots more to come and they will be a little more interesting I'm sure as I'm planning a Canoe/wild camp soon. But this was a good start. Please keep it clean and polite, not that im a prude but this is a public blog and manners cost nothing. across that angry or that glimmering sea. who take the golden road to samarkand. and softly through the silence beat the bells along the golden road to samarkand. 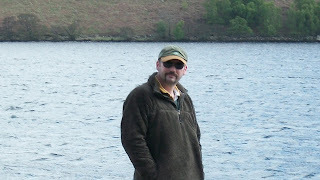 Born 1969 in England, I lived in South Africa until '76. In '77 I was given my first sheath knife and I started to learn about the outdoors. I lived all over then joined the British army and lived all over some more. 2013 I suffered a Brain haemorrhage. 2014 with mounting stress from my condition I suffered a heart attack. I am still a student of the great outdoors and now live in the mountains of Bulgaria having simplified my life down to the bare essentials. Warmth, shelter, food, water and the things that make us smile are all we need to be truly rich. I try to be at one with the nature that surrounds me now, and enjoy the simplicity of my life, unfettered by the meaningless trinkets of the modern world that so many seem to worship.